A lot of people visit Las Vegas to win big at slot machines, hook up, and check out the Grand Canyon -- all things that are easier said than done. Especially the Grand Canyon, which despite being a major part of the Vegas tourism industry, is farther away than most people think. You're looking at a drive of more than two hours just to reach the West Rim, and there's no direct highway. But yes, you'll probably insist on going anyway, so check out the best options for planning a Grand Canyon detour from Las Vegas -- without putting in a ton of work. Most tours don't stop once the warm weather ends either. The crowds thin out in the winter months, and even though temperatures drop, it still makes for glorious views. The road to the Grand Canyon can be a bumpy one, so unless you're willing to brave the elements, leave the rental car at the hotel. 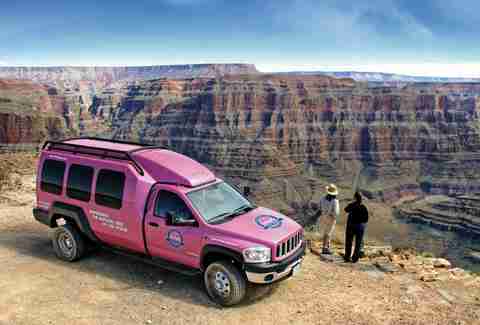 Pink Jeep Tours is a reliable smooth drive, thanks to its Tour Trekker -- a custom-designed Chrysler off-road vehicle that's loaded with an entertainment system, upgraded air conditioning, and reclining leather seats for about ten passengers. Pink Jeep is known for having seasoned guides -- especially older dudes who've "been there, done that" -- and are well worth the ticket price. Tours are offered to both the South Rim and West Rim -- with access to the infamous Skywalk and yes, it costs extra. Some trips include detours to the Hoover Dam and incorporate their own small planes or helicopters for scenic aerial views. If a drive feels too long, a helicopter can cut your journey to the Grand Canyon down to about 40 minutes from the Las Vegas Strip. Along the way, you'll enjoy sky-high views of the Hoover Dam, Lake Mead, and maybe even a few wild horses roaming the desert sagebrush. (Also, watching planes take off underneath you when passing over McCarran International Airport is a trippy experience.) But the arrival at the Grand Canyon itself is a true dramatic moment -- as the helicopter rises above and over the rock formations of the West Rim and dips into the colorful canyon walls with the muddy Colorado River below. Sundance Helicopters has a couple cool packages to make the most of your day at the massive national park. In addition to flyovers of the Mojave Desert and Joshua Tree National Park, the "Heli & ATV Adventure" includes a journey through the Grand Canyon with a quick lunch after landing at the base. 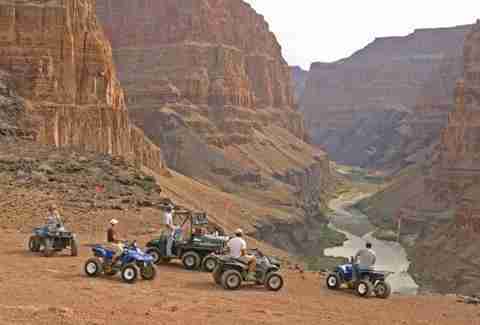 You'll then be taken to Lake Mead for an ATV tour across rugged terrain and a river swim. The "Heli & Horsepower Tour" also offers a helicopter ride to a scenic Grand Canyon bluff, but then follows up the experience with a heavy-on-the-pedal drive around Lake Mead from behind the wheel of a fast car from Exotic Driving Experiences -- like a Porsche or a Ferrari. Sign up and strap in. 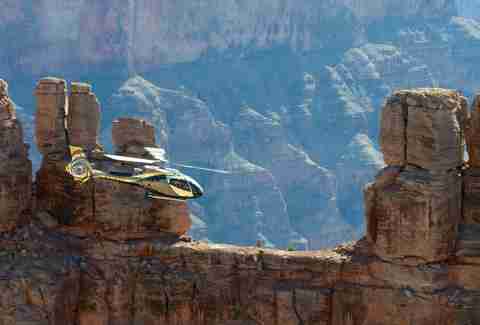 For alternatives, Maverick and Papillon also have packages for flying helicopters to the Grand Canyon that are worth considering. Cut down your travel time even further on board a Vistaliner from Grand Canyon Scenic Airlines. The aircraft has room for 19 passengers and oversized windows designed for scoring the perfect photos to bring back home or show off on Facebook. 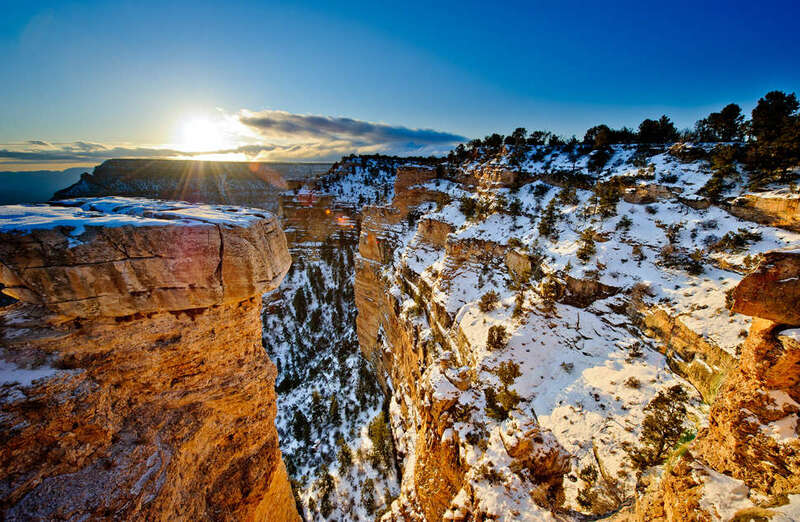 The "Indian Adventure" tour gets you to the Grand Canyon in 35 minutes with a four-hour self-guided walk among Native American land in and around the West Rim. The "North Air Tour" ventures to the more remote North Rim where you can skip the larger crowds and visit the Bar 10 Ranch. Flights depart from just outside Vegas in Boulder City, with coach service provided from your choice of hotel on the Strip. The best things come to those who wait -- or can hike on foot. 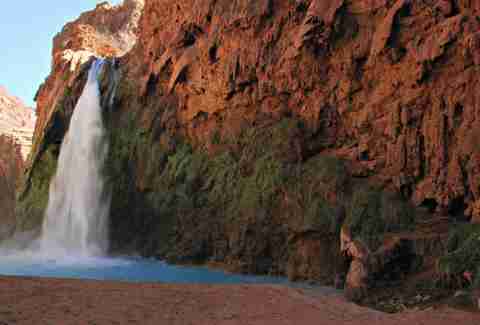 If you really want to enjoy something special, plan a trip to Havasu Falls. The remote campground is an eight-to-ten mile hike from the small village of Supai south of the Grand Canyon. There are no gift shops or places to buy water along the way, so plan carefully, be in top shape, and stay hydrated. The payoff is a gorgeous lagoon with bright blue waterfalls, dramatic rock formations, and lush green plant life. The land is owned and operated by the Havasupai tribe who keep a tight grip on access with reservations offered on an extremely limited basis each year. Pull this journey off and you'll have selfies to last a lifetime. Just don't expect any tour guides or phone charging stations to help you get through it all. The campground is closed in the winter, making this experience a journey best savored in the spring and summer. Start planning now. Reservations must be made in advance and require at least one overnight stay. No day hikes allowed. The Grand Canyon is 277 miles long and up to 18 miles wide. That gives you plenty of room to parachute into it -- right? 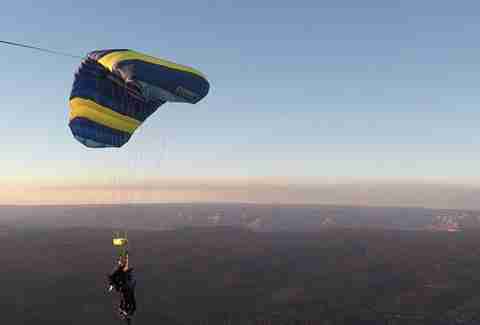 Paragon Skydive offers tandem jumps from a plane high above the Grand Canyon -- and you'll probably feel better being strapped to someone who's done this before. The freefall reaches speeds as high as 135 miles per hour before the parachute opens -- and you peacefully float down to the ground while soaking in the scenery. 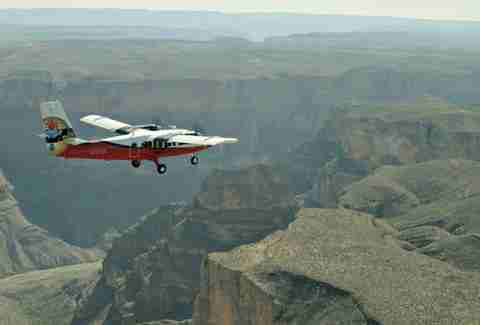 You won't actually land inside the Grand Canyon, but you'll be high enough in the air to feel like you might. Flights take off from the Grand Canyon National Park Airport at the South Rim. Paragon will arrange ground transportation -- or air transportation via Maverick Helicopters -- from Las Vegas. 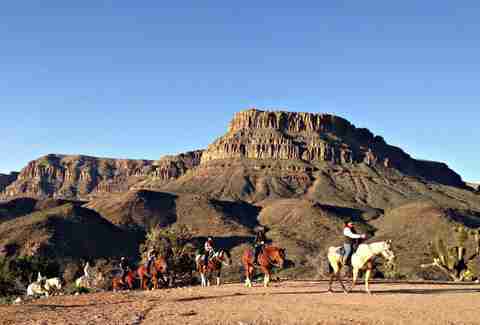 The Bar 10 Ranch is a remote family-owned cowboy-style getaway near the North Rim. It also happens to have its own airstrip, which makes it somewhat convenient for tourists seeking an up-close look at the Grand Canyon. For something really cool, check out the "Air & Ground" tour, which includes a flyover as well as an ATV excursion. You'll have a tour guide, but still feel the freedom that comes with driving yourself through the inner gorge close to the Colorado River. We've already mentioned the Skywalk. So what's all the fuss about? 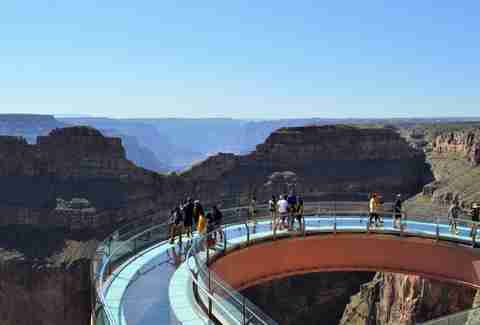 The 70-foot-long curved pedestrian bridge hangs over the edge of the Grand Canyon -- with a glass bottom to provide maximum freak-out factor. The view is staggering at around 4,000 feet above the canyon floor -- or nearly three times the height of the Empire State Building. Generally, you can only reach the Skywalk as part of a tour package and -- most people hate this part -- you're not allowed to take your own photos. Phones and cameras aren't allowed on the bridge. So if you want a pic, you have to shell out the cash for one taken by a staff photographer. 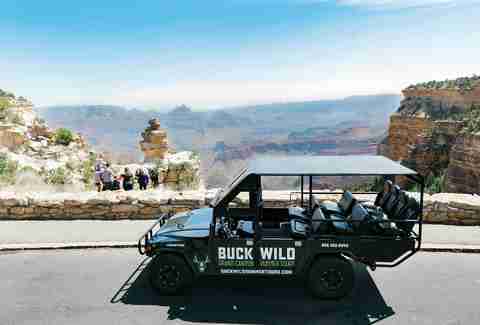 Buck Wild Tours takes old military Hummers and custom-designs them into serious pieces of equipment for exploring the Grand Canyon. The tours last around two hours and cover the South Rim, where you might even spot an elk if you're lucky. It's worth shelling out a few extra dollars for the sunset tours, when the colors of the canyon really pop on your camera lens. The Hummers are equipped with stadium-style seating, to make sure everyone gets a good view. The vehicles are open-air in the summer, but closed with climate-control functions when the weather cools off. You may even get a blanket to stay snuggly and warm. For those who really value privacy, the entire Hummer can be booked for less than $1,200 a tour. Henderson-based All in Aviation teaches people how to fly in small personal aircraft in the skies above Southern Nevada. 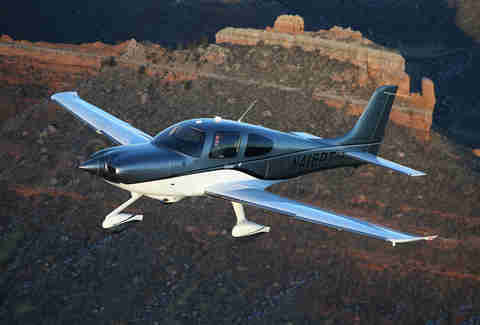 For as little as $500 an hour, you can make a day trip out of it and take a round-trip flight lesson to the Grand Canyon on a Cirrus SR22. You can bring up to three buddies and stop for lunch before returning home. Just keep your hands on the wheel. The Grand Canyon Western Ranch offers plenty of Old West charm plus the convenience of glamping in a choice of pine cabins or furnished tents. Located just minutes away from the Western Rim, the ranch will coordinate travel from Las Vegas by road or helicopter and get you set up with plenty of cowboy-worthy activities. Ride horseback through rugged nature trails, chomp down on food from a campfire, and watch buffalo roam wild in their natural environment. Somewhere in the middle of all this, you can pull yourself away from the fun and take a helicopter tour of the Grand Canyon. For a totally different way to appreciate the majesty of the Grand Canyon, check out the view way down below from the Colorado River that passes through it. 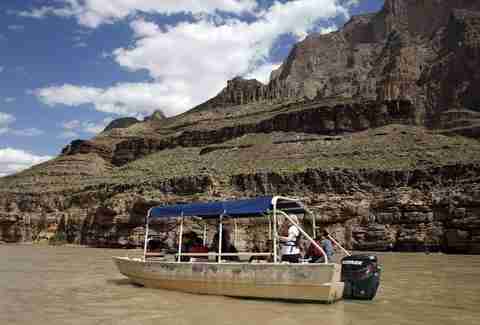 As part of its "Voyager Tour," Grand Canyon Scenic Airlines will hook you up with a pontoon boat cruise after dropping you down 4,000 feet by helicopter. The water ride is about 20 minutes -- enough time to develop a mild sunburn despite the overhead canopy. Rob Kachelriess has been writing about Las Vegas for Thrillist for five years. His work has also appeared in Travel + Leisure, Leafly, Supercall, Modern Luxury, and Luxury Estates International's seasonal publication. He doesn't look down when on the Skywalk. Follow him on Twitter @rkachelries.